In a word: Better than the first two seasons of Mork & Mindy. 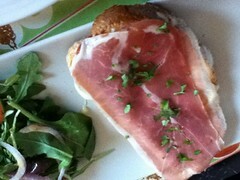 JM ate the prosciutto tartine. 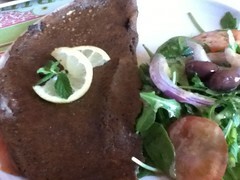 Nichole ate the galette bretonne norvégienne. We split a vegetable soup and two desserts (a Nutella crepe we ordered, and a piece of chocolate cake that was a gift). The bill was about $15/person, plus tip. JM and Nichole gave Chez Nanou an A- (see our grading rubric). 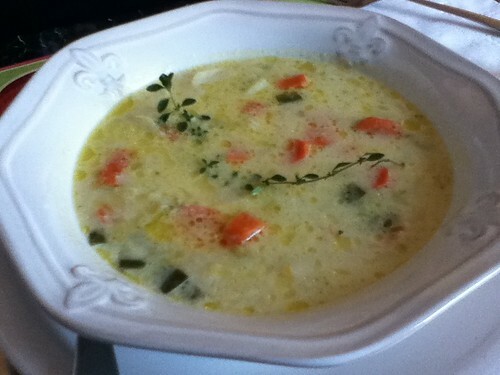 The vegetable soup was a homey and rich combination of carrots, potatoes, and leeks in a light but creamy chicken (we think) broth. A sprig of fresh thyme crossed the bowl, a harbinger of herbs to come. Each of the entrees included a small salad. The mixed greens themselves were just OK, the tomatoes pallid, and the onions aggressively sharp, but the olives were great, and again, some fresh herbs popped up in a forkful here and there. Nichole tried ordering the salad Niçoise but again it was not to be (out of anchovies). She ended up with a truly delicious buckwheat crepe folded over smoked salmon, yogurt sauce, and just a little dill. JM had another ham and cheese. Tender and rich, the sandwich was an absolute delight with neither than bread nor the ham overwhelming the delicate cheese. It was savory in the ways that make a glass of water all the more refreshing. Lunch was so laid-back and relaxed that a dessert seemed deserved. We got the Nutella crepe, a tender pancake folded over a schmear of the good hazelnut stuff, topped with whipped cream, toasted almonds and powdered sugar. 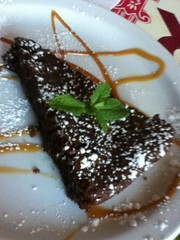 Halfway through the crepe, out from the kitchen came a round of warm chocolate cake over caramel sauce. Nanou herself brought each table a slice, and oh was it good, with a little mint on top. Chez Nanou is only open for lunch and the occasional dinner. But you really should make a special trip for this special food. Seconded. This place is a little gem. I love this place! 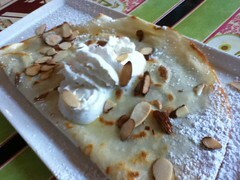 The dessert crepes are to die for! Those dishes look WONDERFUL. I am checking this place out soon!